We like it big here in the United States, from Big Macs and Big Gulps to big cars and big homes, and to the latter, it is certainly no secret that as Americans we love our McMansions. The average U.S. new home construction size has nearly doubled since 1982, from approximately 1300 square feet to over 2400 square feet today, while the average household size has decreased. It is our homes, not household size, where I will spend my time today. Contrary to what you might expect from the title of this piece however, I will not advocate for the building of smaller homes per se, no, I firmly believe that if a family can afford and desires a certain square foot home they should indeed build said home. I will instead focus on the building materials of the homes themselves, which may or may not have implications on the eventual square footage. I wonder if we've lost sight of the quality and durability of our building materials and in turn our homes in a quest to build ever larger dwellings. Is the end goal to build with the future in mind or squeeze every last square foot from our allotted budgets? Home as they say, is where the heart is. A man's home is his castle and so forth. In regards to this discussion, I would politely add the saying: They certainly don't build 'em like the used to! The house, as you might expect, was built to last, and thankfully so! The basement walls are stone, and the exterior walls are 12 inches of classic red brick. While yes, the house has received some upgrades over the years (we do have indoor plumbing and electric!) the basic interior and exterior load bearing walls have remained largely unchanged for over 150 years. While our friends in Europe would chuckle about an American chap getting excited about a 150 year old house, when one considers the durability of homes being built on U.S. soil today, a house built to last is the exception, not the rule. I propose then that we think long and hard about the materials with which we are building our new homes, and specifically concrete vs. wood. As a disclaimer...I am certainly biased here. Not only did I grow up in a stone and brick farmhouse, I spent six months after college graduation working manual labor in the construction industry, namely poured wall concrete and masonry. I built close to 50 concrete basement foundations in that time, only to sigh a bit as after my hard work with forms and wedges and seeing a beautiful finished concrete wall system, the framers would come by and add the wood framing. There is, in my humble opinion, a better option than wood! Increased strength and durability, especially in areas vulnerable to high winds such as the East Coast, Gulf Coast, and Midwest. With regards to high winds specifically, see the tornado damage of the three homes in the picture below. 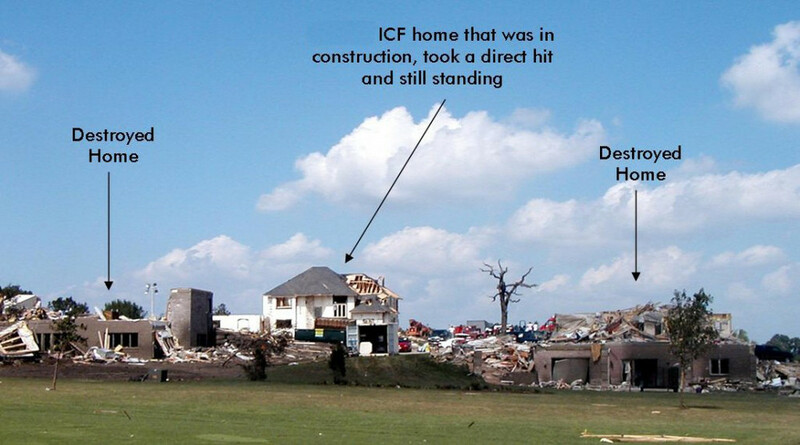 Look closely and you can see the concrete/block foundation walls of the homes on the left and right are still intact...anything above was wood frame and was destroyed. The home in the middle stands strong, with the only major damage being that of the...wood roof. I think back to our farmhouse and the amount of storms and high winds that surely occurred between 1859 and 2015. How many trees on the farm were brought down by high winds in that same time period? I remember a few major storms from my youth, but the house still stands firm. In which home below would you want to live? With all of the benefits of concrete over wood, you would think that ICF would be the norm and we would all be building concrete homes. How I wish! If there is a drawback to building concrete homes, it is the cost. While the increased cost varies depending on the contractor and building location, you can expect to pay, at the high end, about $4.00 per square foot more for a concrete home. Herein lies the issue and the struggle for many Americans when looking to build a new home. Do we build smaller and from better materials, or do we get the most house per dollar and choose wood and vinyl over concrete, stone, and brick? Let us consider again the average 2,400 square foot home, with the average cost per square foot of $93.70 according to 2013 U.S. Census data, excluding land costs. A standard wood frame house at the aforementioned numbers would cost 224,880, with the ICF cost of 234,480, about 10,000 dollars more. Is the peace of mind of a concrete home worth the extra 10,000 dollars and subsequent cost in the mortgage over the next 30 years? Yes? No? If the answer is no, perhaps we were to instead build a 2,300 square foot concrete home and spend the same 224k? A former student-athlete of mine from my Penn State days is building a concrete home near Mobile, Alabama as we speak, and when deciding on construction materials and considering the frequency of Gulf hurricanes, there was no question as to whether or not he would build with concrete. I wish everyone in the Gulf area and the Midwest would do the same! 6 inches of solid concrete walls. This home will handle the Gulf hurricanes! For an in-depth comparison of wood vs. concrete, check out this article, and if building a new home is in your future, remember my thoughts and please consider an all concrete home. While yes, of course I am biased, the benefits in my humble opinion far outweigh the costs, and you could always build a smaller home and spend the same amount. As a former mason/concrete construction worker - my friends in the block/concrete industry will thank you! A final word on the McMansions...can you imagine building an 8,000 square foot home out of wood? As my fellow Eagles fans would ask...for who? For what?